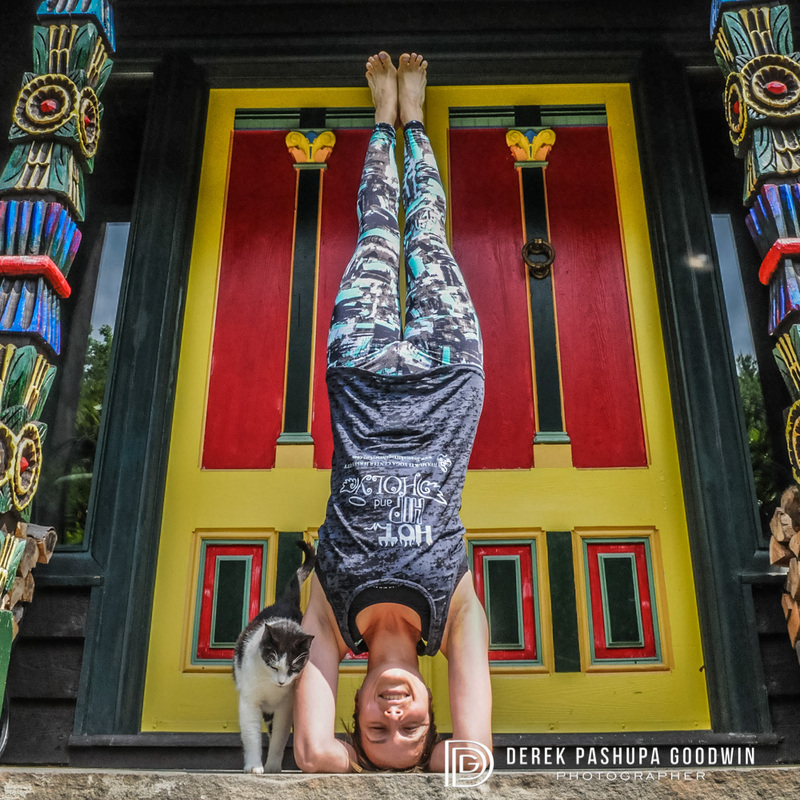 If the traditional cat pose is too easy for you, try posing with a cat in headstand! In honor of Shri Dharma Mittra's 2017 birthday, Dharma Yoga NYC sponsored an "Instagram Challenge to raise funds & build awareness for our animal friends" #loveallbeings. The goal was to raise awareness of animal issues, and bring some charitable donations to Farm Sanctuary, People for Ethical Treatment of Animals (Peta), and the Humane Society of New York. Please consider donating, they can always use your help! I used the challenge opportunity to dig up some old yoga photographs of animal poses, and to create some new ones. To gain the full benefit of these yoga asanas, try to imagine yourself as the animal you are imitating, and remember to breathe! Breath connects us to all other beings. Cat Pose (Marjaiasana) and Cow Pose (Bitilasana) yoga sequence, with Brooklyn cat graffiti. Model is my partner Siewli Stark. Siewli Stark performs a variation of Lizard Pose in Williamsburg (Brooklyn NY). This photograph is was taken of Leah Song in New Orleans. Leah is one of the sisters and vocalists in the band Rising Appalachia. I was collaborating with my friend New Orleans Henna to do yoga photos with henna. The henna is on Leah's hands, the rest of her tribal body art is tattoos! This photo of April Dechagas was taken on Rockaway Beach in Queens, NY. April is a Jivamukti Yoga teacher and a friend of mine who inspires with her dedication to learning Sanskrit and anatomy and perfecting the Jivamukti Yoga method. Matseya is an incarnation of Vishnu, and the first fish to learn yoga. This photo is of me at the abandoned Six Flags in New Orleans, that was destroyed by Hurricane Katrina. Usually hanumanasana is done on the ground, but in tribute to Hanuman, who performs this pose as he jumps over the ocean to find Sita, I am doing it in the air! There are two versions of this pose in the yoga world, this is the one we learn in Jivamukti Yoga and also that Dharma Mittra teaches. It looks like camel pose, but the difference is the yogi is on the balls of her toes. This yoga pic is of my friend Karina Bono, who I met at the 2011 Jivamukti Yoga teacher training. She is currently living in Woodstock, NY, but was in Union Square when we created this image in front of the historic Grace Church. One of my favorite hip and shoulder openers! If you squint you can see a cow's face. Photo is Siewli Stark in New Orleans on a cow seat next to the Seed Cafe. Siewli again, we created this video on the last day of the challenge near the Verrazano Bridge in Brooklyn, NY.